The best gift has very little to do with the price tag, and more about the thought that went into its selection. This is why generic gifts tend to disappoint recipients. But you have to admit that gift shopping is rocket science. At least this is what some people think. Well, what if you can find an item that seems generic, but not? The best example? 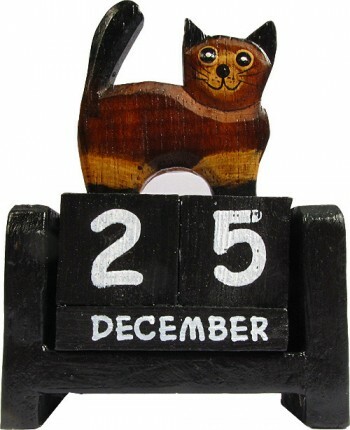 Wooden calendars. Now do you see why it’s generic but not? Calendars have now become freebies, especially during Christmas and New Year. This is why its popularity as a present is zilch. They’re not exactly something you’d wrap and put a bow on it. 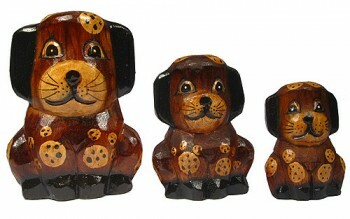 But the Balinese wood calendars we offer are a category on their own. They tell you the day of the month, but in a more creative and attractive way. 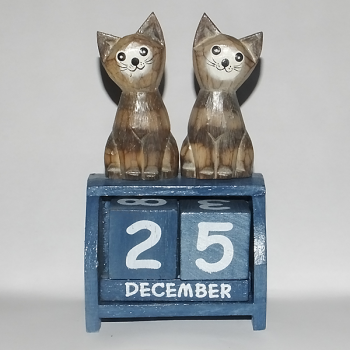 Cute cats, dogs and turtles carved out of a piece of wood, and set on top of the wooden calendar make for a great table-top accessory. So it’s not only functional, but beautiful as well. 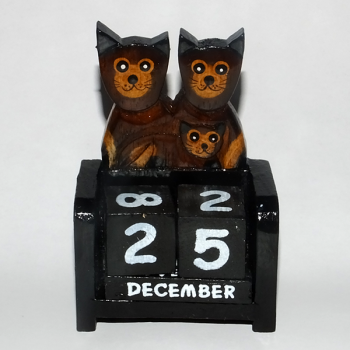 With our Balinese wooden calendars, there’s more than a thought that went into their creation. Wood carving, after all, is an artisanal process that involves the use of a cutting tool and expert carving skills. The detail on the topper is proof of the level of care and craftsmanship that went into every piece. So even if you bought it online, the workmanship involved more than makes up for the ease of purchase. 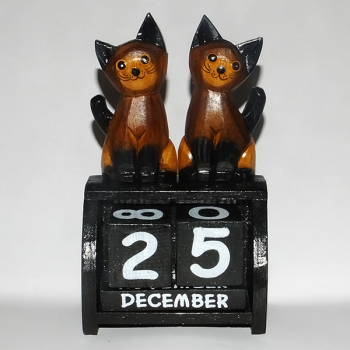 Unlike printed calendars, the days and months of the wooden calendar are not tied to a particular year. This means you can use and re-use it for as long as possible. No need to buy a new one at every turn of the year, although no one can stop you from starting a collection of these beautiful and functional perpetual calendars. 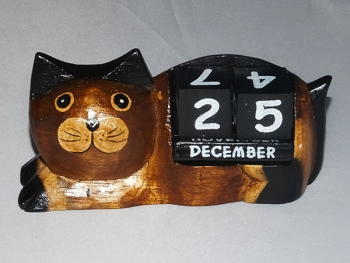 The wooden calendars serve more than one purpose. 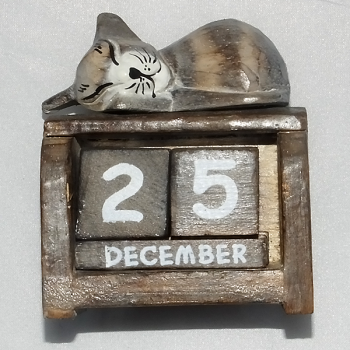 It not only works as a decorative calendar, but also as a paperweight and a display feature. They won’t get blown away, but help keep paper on the table when the wind blows. 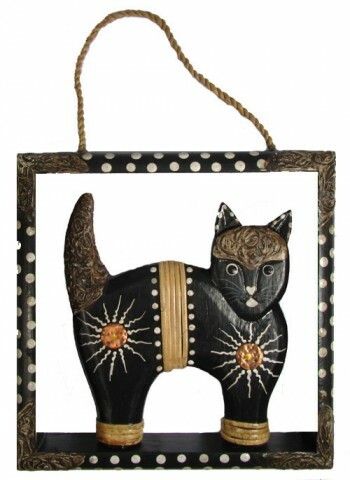 Their decorative design and intricate details also make them worthy of a spot on your desk or display case. 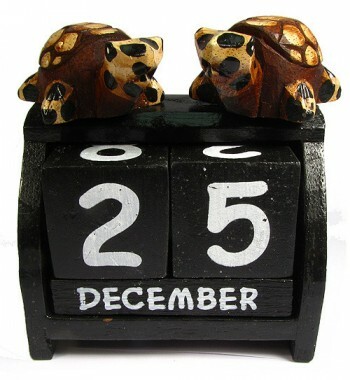 So this Christmas season, give the gift of a “new day” every day with our Balinese wooden calendars. 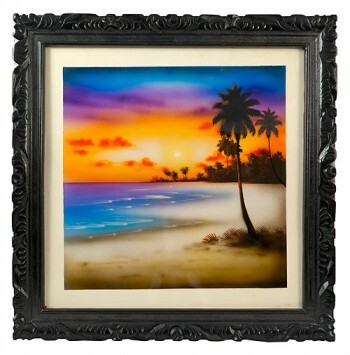 Decorative pieces that cost less, but priceless in purpose. Calendars serve as a reminder of the cycles of life – birthdays, holidays, special occasions, etc. Might as well remember it with flair, right? Many of the most creative pieces of artistry, craft or design come from, sadly, less developed countries. Many years ago, the prospects changed where people started to see that by letting smaller nations trade with larger nations, it would help their economy more by being able to sell in larger bulks and therefore generating more money in the long-term. This would mean that more income would mean a better country, as it would go down through the company and improving the lives of many. It also meant that they did not have to sell their goods for minimum amounts, allowing the country to keep their self-respect and generate further interest in the country for the future. This is now common practice for many countries, especially in arts and crafts, and this is called “Fair Trade” and it has seen a massive improvement across many countries. For example, the people of Bali have created a powerful infrastructure through their years of culture and craft creating outstanding artistic pieces. At Your Crafts Fair we provide some products from the land of Bali. The heritage of the country provide many unique wood carvings and jewellery which go down a treat all across the world. Bali has, for many years, been one of the main location of many great crafting artisans, and we like to provide all of our customers with access to as many great Bali wood carvings nice jewellery and stylish bags as possible. However, fair trade is important as many people have looked to abuse the label for their own gain. Many craftsmen have claimed to have huge access to a massive library of different Bali goods, with ranges of different types of craft and jewellery that a company with a huge workforce could not build. Due to the sheer quality of the Bali goods, and the skill it takes to create each product, it would be almost impossible to employ enough genuinely skilled crafters, so beware any company which shouts about Fair Trade, while offering huge volumes of Bali goods – they may not be telling the entire story. Most of the craftsmen in Bali provide work for a small group – usually family members – and do not branch into more Western-style corporations. This means taking on negotiated prices to get the sales, or risk missing out to different competitor. Fair Trade is beginning to help the skilled workers earn a little bit more for their families and pass the wealth through the economy. Although children learn many different aspects of crafting, Bali does not rely on child labour, meaning that they have to pay more in wages and thus charge more for their works – this is why Bali goods can be a little bit more expensive than other countries, but the quality is certainly worth it. Overall, Fair Trade is quickly becoming a way to help smaller countries develop and help their people learn more in the process, while also improving the economy. As for the environment because all the goods from Bali offered at Your Crafts Fair are handmade and not mass produced in factories there is very little to harm caused to the local environment. 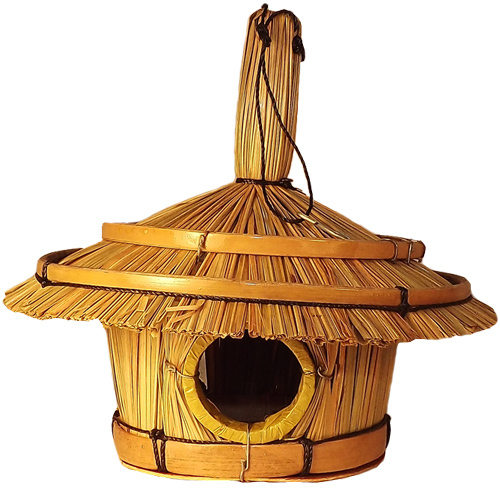 The types of wood used for most of the handicrafts are from sustainable sources. Everything is said above is our honest opinion based on the knowledge of our wholesalers gained through importing from Bali since 1989. The statements we have made have been made without prejudice and, if you feel, we have been inaccurate or unfair in any of our statements we would welcome your comments which we will be happy to respond to.